So you’ve already decorated your home, finished the kids’ costumes, and loaded up on candy to hand out to excited trick or treaters. You forgot one thing though: a costume for your car! Don’t panic. 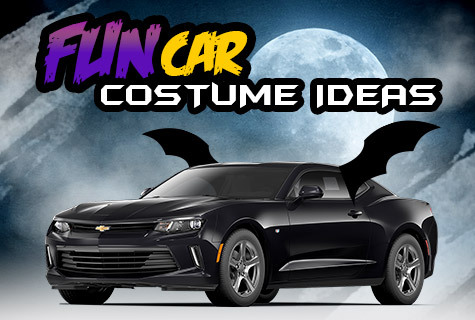 Check out these easy car costume ideas to really step up your game this Halloween. A great car costume doesn’t have to be complicated in order to be spooky. If your car has a trunk, craft teeth out of paper or cardboard and attach them to transform your vehicle into a scary monster with a ferocious bite. Halloween is all about being someone else for a night. While the Buick Encore is the model of refinement and sophistication, a pair of oversized glasses makes this smart SUV hilariously nerdy. If you’re on a time crunch, no car costume is simpler than attaching some headlamp eyelashes. Throw these on a Chevrolet Equinox for a funny, flirty car costume. Fashion carriage wheels to fit over your vehicles wheel openings and end up with a rustic car costume perfect for pickups. Slap four of these on a GMC Sierra to create a carriage for any Halloween princess or knight. Who says dress up is for children? Rediscover the fun of playing pretend this Halloween with one of these car costume ideas. And for the perfect car to dress up, stop by Bradshaw Automotive today!